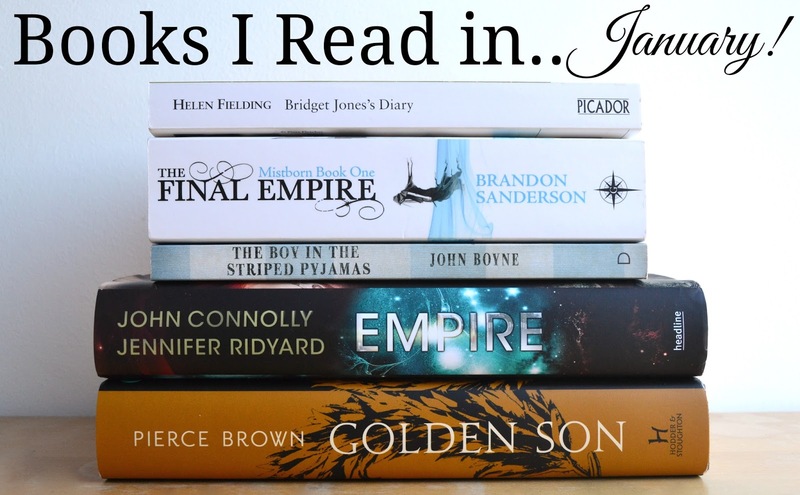 January was a pretty amazing reading month for me, especially when I compare it to January last year. In fact, I completed one of my 2015 Reading Goals! I wanted to read a book over 500 pages and The Final Empire is a massive 660 pages. So that's one goal checked, and I didn't buy any more books which means I'm on point with my buy less goal, and I did full reviews of two of these books! So let's round up. I picked this up on New Years Day for a cliché read to bring in the new year. Every New Years I watch the movies and I love them so I expected that the book was going to be just as good, or better. At the end of every month I pick up the books I've read and sit down with my book journal to write down the quotes that I liked; writing that impressed me, lines that made me laugh or cry, particularly strong moments- anything that stood out to me while I was reading. With this book I had none. That almost never happens, but I think that it explains this book to me. It was a fun read, but all the way through I was a little, well, bored. The movie was better! My name is Imogen and I'm afraid of big books. Yep. They scare me. Anything over 400 pages is a little frightening, 500 pages is terrifying, at 660 pages this book was my equivalent to a horror movie. But read it, I did. And love it, I did. It took me a while to get into this book, in fact at 100 pages- where I would normally pause a book if I wasn't into it, I was still a bit eh about it. But I kept reading and thank goodness I did because it picked up. And it picked up. And it picked up to the point of me reading 200 pages a day to finish it and getting annoyed when I had to leave the house or do some work because I wanted to read goddangit. The writing was a bit simplistic but the story more than made up for it, it was so well crafted and the twists just kept coming. Sanderson is a master of storytelling. I read a review before I read the book that the dialogue wasn't great but surprisingly, I loved it and 9/10 of the quotes that I wrote were speech. It took for me a long time to get into it and I found it difficult to get into the world. But it was well worth it and I definitely struggled on rating this one, but it deserves five stars. I need the next book ASAP. I hit a bit of a reading slump towards the end of January after reading so many great books and really needed something different and short. So I picked up The Boy in the Striped Pyjamas which I read as a kid and while I remembered the basic story, didn't remember much else. This is a great book that focuses on a little boy Bruno who goes to live at a concentration camp where his father is working. It's told from his third person point of view and the writing is quite childish, which actually makes this so much more painful to read. It shows the war from such an innocent view point that it takes on a whole new level of uncomfortable realisation. I cried at the end and even now, after a week, thinking of one line in particular makes my gut clench in uncomfortable sorrow. John Boyne has written another book , about the first World War and I'm wondering how masochistic it is to buy it knowing I will probably cry like a baby. My full review of Empire is here! But without spoiling Conquest, I'll just say that this second book of the series focused on all the great things about the first and built up this amazing world. I am completely head over heels for this series and would recommend it to anyone. My full review of Golden Son is here! However it has spoilers for the first book in the series, Red Rising, so I'll just say that it was okay! Not as strong as the first book in my opinion but a fair continuation of this series and the story.